A bacterial “type” is a particular species with certain features. For example, the bacterial type may be Staphyloccus aureus with resistance to penicillin. To “type” a bacteria, we can focus on several genes, and see which allele is present for each of these genes. Each bacterial species will have its own scheme, which is the set of genes that are looked at. Overall, this process is called multi-locus (= several genes) sequence typing, or MLST. 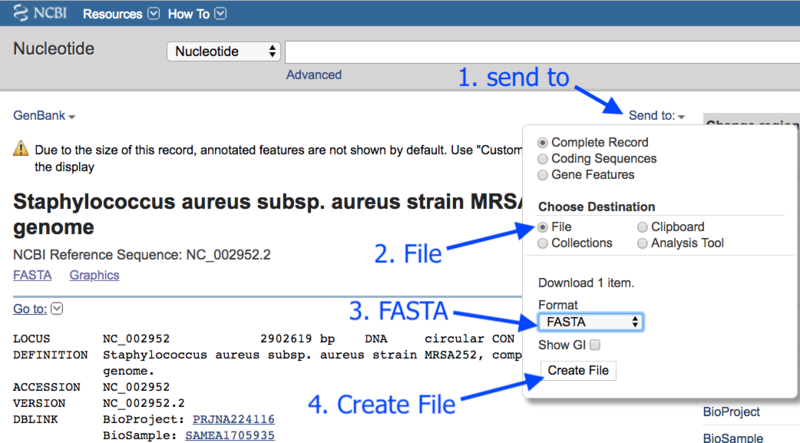 In this tutorial, we will perform MLST on a bacterial sequence. If you are using Galaxy Australia, look for the file we need in the Shared Data. This should now be your current history. Alternatively, we can get the sequence from Genbank. This downloads sequence.fasta to your computer. This file should now be in your History panel. When it has completed uploading, the file name will be green. In the tool panel search box, search for MLST. The tool interface will appear in the centre Galaxy panel. The results file will be at the top of your history panel. Click on the eye icon to view the output. Your results will be a single line. The rest of the columns: the gene names with the allele number in brackets. It is this combination of alleles that defines the sequence type. In this example, our sequence type is ST=36. This is methicillin-resistant Staphylococcus aureus (or MRSA). The MLST analysis should now be showing as your current history.